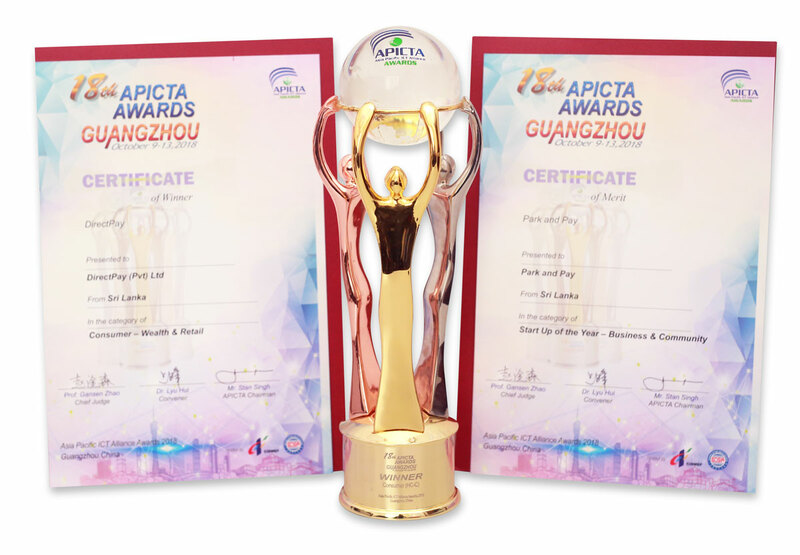 Friday, 19 October 2018, Colombo: The 18th Asia Pacific ICT Alliance (APITCA) awards 2018, which was held in Guangzhou, China from the 10th to 14th October, named DirectPay as the overall winner in the Consumer - Wealth and Retail Category and Park and Pay with a Merit Award in the Start Up of the Year - Business and Community Category. DirectPay and Park and Pay represented Sri Lanka in a head to head battle with 14 other countries in the categories and rose to the top with highest honours at the spectacular event. The selection process of the nominees was based on their uniqueness, market potential, features, quality, and application. Each nominee had to pitch and was rigorously assessed by a judging panel of the highest calibre, making it a difficult selection process. The Gold award winning product, DirectPay, is an electronic payment option providing a viable alternative to cash and POS systems. It provides an entire infrastructure to facilitate payment requirements with its modular based and service-oriented software architecture. Directpay enables this while supporting the existing structures, allowing the merchants to offer products and services across all possible channels. Moreover, Park and Pay was awarded with a Merit for their app-based innovative solution for motorists to find vacant parking spaces anywhere in Colombo, allowing seamless booking and payment within the app in only 3 clicks. DirectPay and Park and Pay is a spinoff of PayMedia (Pvt) Ltd that has been actively serving in the Fin-Tech industry by disrupting the conventional banking system in Sri Lanka. With the introduction of the DirectPay solution, PayMedia has entered the digital era by changing conventional methods of daily transactions in the payment system. In addition, the company is reducing the cost incurred by the banks and bringing convenience to the end users through innovation. PayMedia has never felt happier in making the nation proud by winning these two awards at one of the most prestigious events in the industry.